An incredible Saturday looks to be in store for WNC weather-wise with highs in the low 70’s, and only scattered clouds expected. Moving into Sunday though, clouds will begin to build, and an isolated rain shower could be possible before more widespread rainfall moves in Monday and into Tuesday. Therefore, the best day this weekend to get out and enjoy the scenery will be Saturday! It’s not too late! Call C.P. Kruse & Co. today to schedule your tax appointment. Give them a call (828) 684-7374 or visit Kruseacconting.com to schedule your appointment! 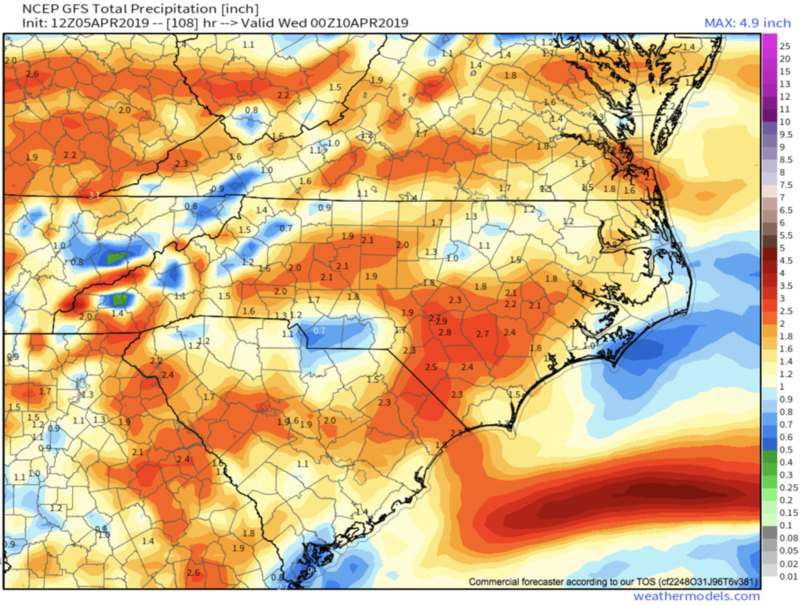 Most models indicate that around an inch of rainfall will be possible for most locations around WNC, with isolated higher totals. I am not expecting a washout from this system, but a couple of rounds of heavy rainfall will be possible, especially Monday night and into Tuesday. Below you can see the most recent GFS precipitation depiction map. So a beautiful Saturday awaits you tomorrow, but clouds will build in Sunday along with scattered showers. As that front approaches, partly cloudy skies will turn to drizzle, and then heavy rain Monday night and into Tuesday. Between 1”-1.5” of rain is expected for most locations around WNC. More rainfall could be likely Tuesday and into Wednesday, but there is some disagreement among models currently at this time. Enjoy Saturday, and prepare for more rain early next week.